Swadesh Milk Products Pvt. Ltd. (200 cr. Turnover) was Establishment 20th August 2004. It was previously devashish dairy pvt. Ltd. promoters have vast experience in dairy industry from last more then 50 years, the plant is located in milk pocket area at Pyarepur sariyan near barabanki. Due this plant milk producers got market for their milk at door step. Swadesh milk pay them higest price of their milk as per quality and thereby improve there economic condition. This plant has given employment generation to all most 5000 people directly and indirectly. company is iso 22000 : 2005 certified company. The plant is managed by highly qualified and experienced officers. The present capacity of plant is 1.5 Lakh L.P.D. To be Number one in quality for marketing milk and milk products in Uttar Pradesh and adjoining states. To double our sale of milk and milk products to 2 Lakh L.P.D. Within a year and add 10 % every year. To established milk processing and packing plant in Allahabad, Varanasi and Delhi / NCR to cater the New consumers. Our target is to increase our turn-over from 130 cr. To 500 cr. Within 5 years. Plant has also setup - 16 milk chilling center at Gonda, Katuanala, Rehra, Chapiya, Mallipur, Bizadi, Sultanpur, Bhinga, Soranv, Koshambi, Amouli, Veersinghpur (Bagiya), Barabanki and about 800 VLC. Milk is tested for quality at this plant by electronic machines. Milk is Purchased as per FAT/SNF content of milk. Producer get milk price payment for 5 days regularly. Milk collection is more then 1 lakh Ltr. 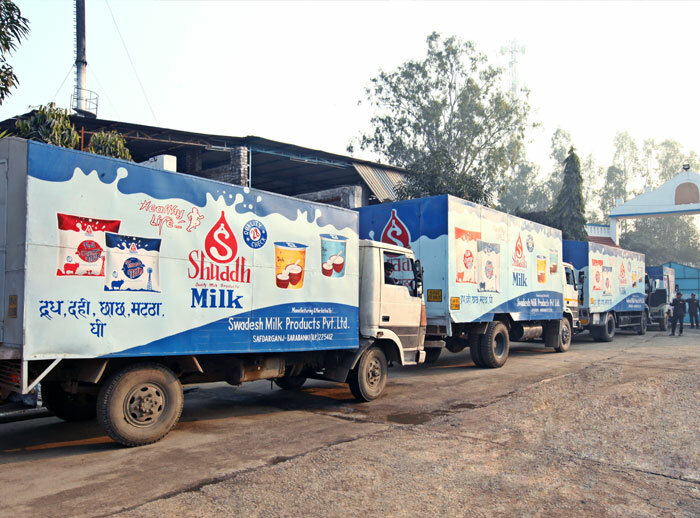 Per day at present fleet of 12 tankers and 60 milk vans are deployed for this purpose. Presently Plant Supply milk in Polypack, Paneer, Ghee, Chanch, Plain Dahi, Sweet Dahi, Lassi, Masala Chanch to Lucknow, Allahabad, Kanpur, Unnao, Basti, Faizabad, Sultanpur, Bahraich, Gonda, Akbarpur, Varanasi, Gorakhpur, Khalilabad, Bihar, Hardoi, Farrukkhabad, Kannauj, Bangarmau, Sitapur total milk sale is around 1 Lakh L.P.D. And staff engaged per market is around 150. total 31 insulated vans deployed for supply of milk and milk products.